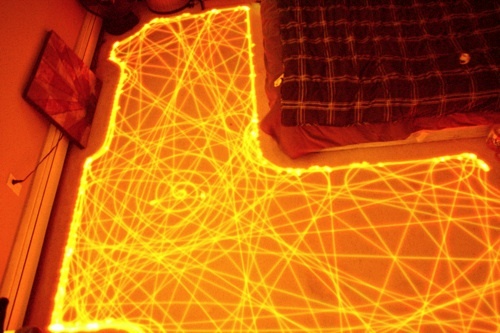 Now here’s something interesting, I set up a photo camera in my room, turned out all the lights and took a long-exposure shot of my roomba doing it’s thing for about 30 minutes. The result is a picture that shows the path of the roomba through it’s cleaning cycle, it looks like a flight map or something. It really hits every spot! This raises the interesting question of what the Roomba would take in a different room, or if it had a different starting point in the same room, or even if it would repeat itself from the same starting point. I lack a robot servant, but should get one. If any of you got one and felt like recreating this experiment, please post photos in the comments!